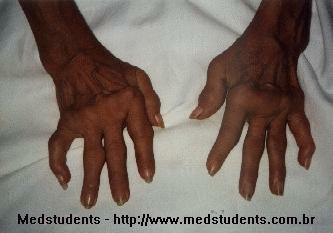 Rheumatoid symptoms usually develop with an insidious (slow, sneaky) onset. 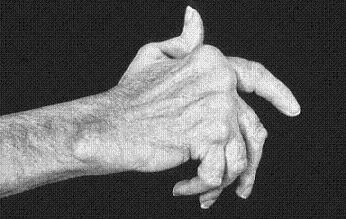 It often involves the small joints of the hands, wrists, and feet initially. This is usually in a symmetrical pattern, where the same joints are involved on the right and left sides. Because RA is an inflammatory disease of the synovium (lining) of the joints, this synovium becomes reddened, warm, swollen, and oozes extra fluid inside the joints. This causes the appearance of joint swelling, limited motion, warmth and tenderness to the touch. Permanent stiffness, muscle wasting, and joint fusions can also occur. Theses additional problems can make treating this disease quite challenging. Eventually, R.A. leads to joint deformity and loss of function. There are typical characteristic hand and feet deformities that include subluxation (near dislocation) and dislocation of the joints of the hand, particularly in the small finger joints and the metatarso-phalangeal joints where the fingers join the palm.